The street vendors of Istanbul have a remarkable ability to adapt to changing conditions in the city. It only takes a few drops of rain for men to appear on every street corner with trash pails full of plastic, pastel colored umbrellas. A few snowflakes fall and folding tables full of acrylic hats, scarves, and gloves appear intermittently along Istiklal Avenue as if by magic. One can always tell when a football match is happening and which teams are playing by the jerseys, scarves, and flags the street vendors sell at metro entrances and bus stops. When the weather is hot, people sell ice-cold water. When the weather is cold, men go around with large, aluminum thermoses peddling tea and instant coffee to pedestrians. In the fin de siècle passages of Beyoglu where people gather for an evening out, women sell red roses and young boys walk around with hats, flower chains, and various plastic creations that light up. These people lead precarious lives on the edges of the informal economy that has been created by the neoliberal economic policies at the center of the protests. On Tuesday, June 4, every single street vendor I saw along Istiklal Avenue was selling equipment to protect one’s self from tear gas. 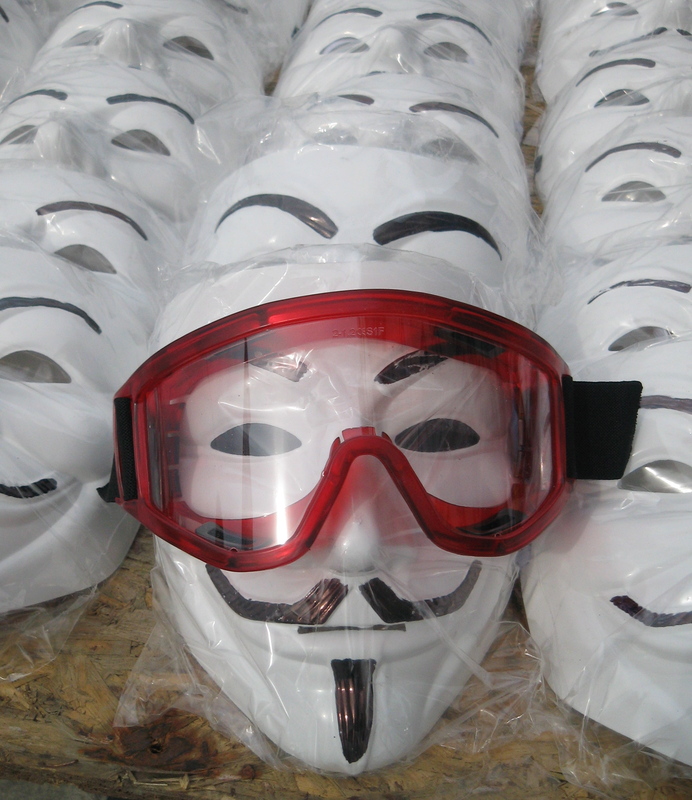 A man I often see in Nevizade selling funny glasses and headbands was selling facemasks and protective plastic eyewear. He had strung facemasks along his right arm and goggles along his left arm. 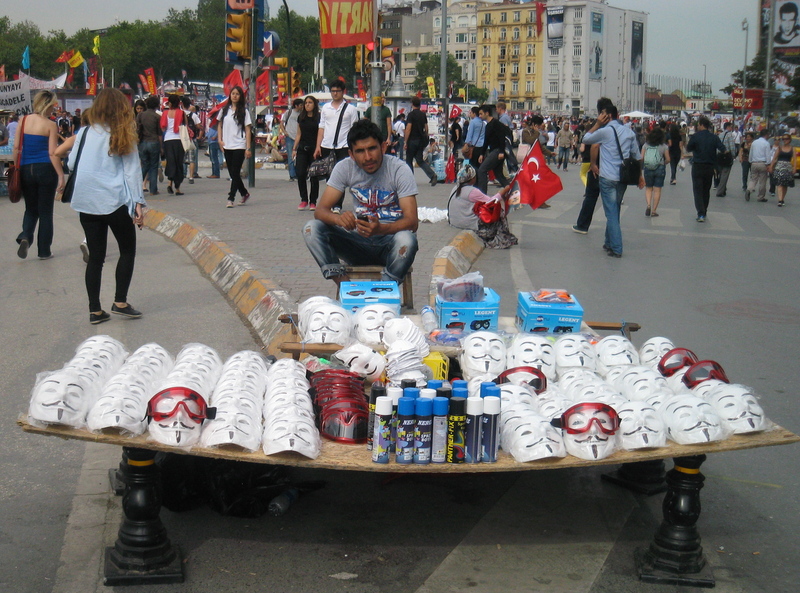 Three lira each or five lira for a mask and a pair of goggles. 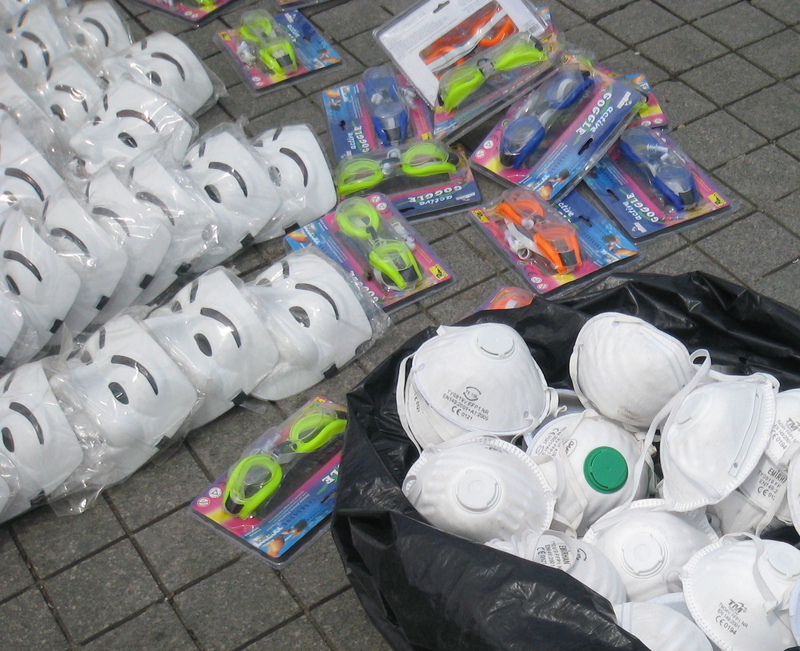 Along the city’s main pedestrian street, every 100 meters there were vendors with large cardboard boxes full of surgical masks and various kinds of eye protection. In Taksim Square and the Gezi Park, vendors had carefully arranged yellow construction hats and primary colored swimming goggles on checkered picnic blankets. Despite the truth of her comments, people continued to purchase the items the street vendors were selling. But they weren’t buying masks, goggles, and hard hats because they needed them per se. They were purchasing them as souvenirs of the spectacle, paraphernalia of the revolution. The abundance of the items and the ease with which people could purchase them served to mock the violence police had unleashed against the protestors. They spectacularized the cracks in the regime’s authority.